In case you missed it, check out my post from last week about a relatively new online source of geoscience information and images, the Virtual Seismic Atlas. One of the coolest parts of a 3D seismic-reflection survey is the very detailed map of the sea floor. This image is a perspective image of the sea floor in deep water offshore the Niger Delta. The most prominent features are the submarine channels cutting across the slope. Also note the narrow ridge that is roughly perpendicular to the channel trend (near the green-gray boundary by color). These ridges are compressional features caused by folding and thrust-faulting of the underlying sediment. The upper part of the slope on continental margin deltas such as the Niger will typically have extensional (i.e., normal) faults – in deeper water near the lower slope or base-of-slope, that updip extension is balanced by a compressional zone. Also note the scale of these submarine channel systems (scale bar on lower left) … these suckers are big. Sea bed images derived from 3D seismic for part of deep-water Western Niger Delta. The submarine canyons carve through ridges that are underlain by anticlines that represent part of the deep-water fold thrust belt. Various generations of canyons can be identified on the basis of cross-cutting relationships. See the original image from VSA here. As long as I have been in Geology, I have never heard of deep water fold and thrust belts.. a quick search shows these are really common on large continental scale deltas. How do they form? Do all major delta’s have them? CamArchGrad … they are very common on the world’s largest continental margin deltas … I will post some more information about them soon. 1) Sediment loading on the upper-slope of the delta. 2) Rheologically weak stratum within the delta (i.e. Ductile Evaporites and Shales). The weaker strata owing to the increased sediment load, overpressure and becoming basal failure planes known as décollements. These décollements link the up-dip extension system to the down-dip (deepwater) compression system, accommodating the structural instability via gravity-driven failure of the delta. Another common feature of deltaic gravity-driven systems are known as ‘diapirs’. Diapirs form when a weak stratum (ie Salts & Shales) becomes mobile and squeezes out of the down-slope compression system like tooth paste. Brantosaur … great answer, thanks! Make sure to check out seismicatlas.org, they got some cool images. Can a tsunami occur off the Niger Delta coast? Chima … thanks for the question … I honestly don’t know too much about the tsunami hazard for the western margin of Africa. Very generally speaking, the Atlantic coasts have a smaller risk than other ocean basins. Doesn’t mean there is no risk, just that the probability is smaller. I searched around a little bit and found this report. There is a lot of info in there, hopefully it answers your question or can lead you to getting more information. Thanks Brian for creating this great blog and for posting the info on BHP Billiton’s Seismic-Atlas, they have some great teaching sets. Or some combination of those four sources. Tsunamis are most common in areas with active subduction zones and compressional tectonic margins (i.e. The Ring of Fire) as they have three of the four triggers for Tsunami (Earthquakes + Landslides + Volcanoes). Yet as the name implies Tsunami can be triggered by large scale slope failures in/into large water bodies without Earthquake involvement and these “Landslide-Tsunami” are what geologists and geophysicists are expecting/discovered evidence for in the Atlantic Ocean Basin. S.N. Ward (2000). Landslide Tsunami. IN: Journal of Geophysical Research; Vol 1; No. 8; Pg 01-27. 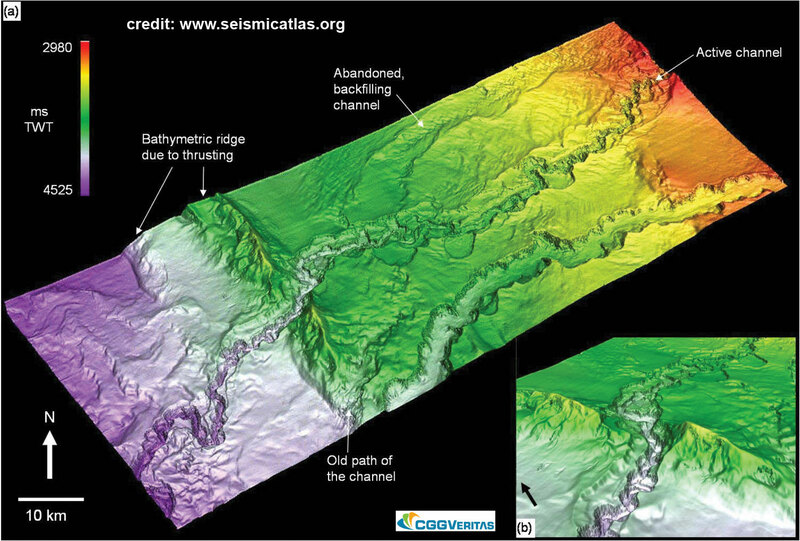 (2) The Norfork Submarine Canyon slide/Tsunami off the US eastern seaboard. (3) And in the Pacific Ocean the Nuuanu Landslide-Tsunami off Oahu, Hawaii. S.N. Ward & S. Day (2001). Cumbre Vieja Volcano: Potential Collapse and Tsunami at La Palma, Canary Islands. IN: Journal of Geophysical Research. Vol. 28; Pg. 3397-3400. C.L. Mader (1999). Modeling the 1958 Lituya Bay Mega-Tsunami. IN: Science of TZsunami Hazards. Vol. 17; Pg. 57-57. Cheers to you both (Brian & Chima). Thanks Brian for creating this great blog and posting the info on BHP Billiton’s Seismic-Atlas, they have some great teaching sets. Brantosaur … your comments were put in my spam filter (probably because of all the links) and I just saw them now. Sorry about that. Thanks so much for all the info and sharing your knowledge of landslide-related tsunami hazards. I’ll have to dig into those very soon. Sorry for the replication Brian. CamArchGrad: Fold and thrust belts are indeed very common on the toe-of-slope of most passive continental margins. They are gravity driven, unline “classic” fold and thrust belts like the Alps or the Carpathians that are driven by compression in areas of plate collions. A typical passive margin always has an area of extensional tectonics on the landward side, and obviously has to have an area of shortenning on the deepwater side. Think of it as one huge landslide. Deepwater Nigeria a neat fold and thrust belt pretty cool to look at it on seismic (although it has some very lousy petroleum geology). I recall a BHP paper that compared deepwater thrust belts to the plate-collion ones. There are some fundamental differences. I.e. the deepwater kind tends to consist of a densely spaced series of imbricate fault blocks, and lacks the typical ramp architecture that one finds in the Appalachians or in the Alps. Chima Okenimkpe: Can a tsunami occur off the Niger Delta coast? Yes. If a massive undersea landslide occurred on the shelf edge, it could trigger a tsunami wave. I believe this has happened once before.